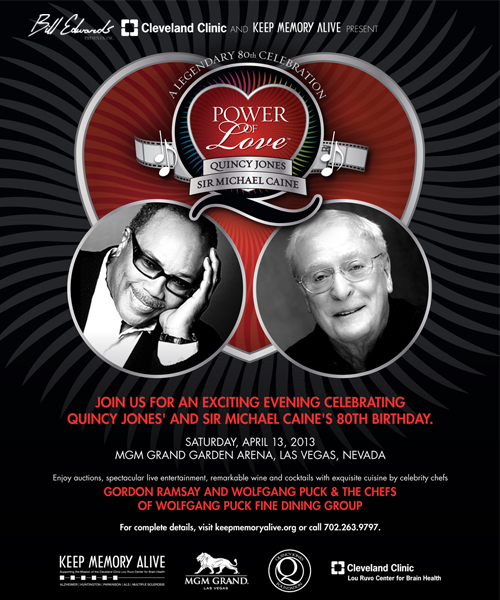 St. Petersburg, FL (April 3, 2013) – St. Petersburg entertainment entrepreneur Bill Edwards will produce Keep Memory Alive’s 17th Annual Power of Love Gala, this year honoring Quincy Jones and Sir Michael Caine, at the MGM Grand Hotel and Casino in Las Vegas, Saturday, April 13. The star-studded tribute celebrates the 80th birthdays of one of the most influential jazz musicians of the 20th century and one of Hollywood’s hardest working actors and Academy Award winners while also raising funds in support of the Cleveland Clinic Lou Ruvo Center for Brain Health. Mr. Edwards produced last year’s very successful Power of Love Gala held in honor of Muhammad Ali celebrating his 70th birthday. This year’s gala will be broadcast live at 12am EDT, Sunday April 14 and 9pm PDT Saturday, April 13 on AXS TV and feature appearances and performances from Bebe Winans, Bono, Carlos Santana, Chaka Khan, Chris Tucker, Herbie Hancock, Jennifer Hudson, Jordin Sparks, Scarlett Johansson, Terrence Howard, Patti Austin, Snoop Dogg (aka Snoop Lion), Stevie Wonder, Whoopi Goldberg, will.i.am, as well as the expected attendance by superstar Barbra Streisand. Celestial twins, born in the same year, same month, same hour and within minutes of each other, one in Chicago, the other in London, Jones and Caine met decades ago and have been great friends. This will be the third time they will celebrate their day together, and this 80th milestone year will be celebrated with the world’s celebrities of music and film. Legendary music producer Quincy Jones, named by Time magazine as one of the six most influential jazz artists of the 20th century, has spent more than 60 years in the entertainment industry working with America’s greatest musicians including Ray Charles, Frank Sinatra, Stevie Wonder and Michael Jackson. One of the most decorated entertainers of his time, Jones has garnered 27 Grammy Awards, a record 79 Grammy nominations, seven Academy Award nominations, a Tony Award nomination and an Emmy Award. Academy Award-winning actor Sir Michael Caine is most noted for his roles in The Cider House Rules, Miss Congeniality and Christopher Nolan’s Dark Knight trilogy. He won an Oscar for Supporting Actor for his role in Hannah and Her Sisters in 1986, and then again in 1999 for The Cider House Rules. In keeping with its 16-year history, Keep Memory Alive’s Power of Love Gala will include a celebrity-chef dinner, a one-of-a-kind live and silent auction and a night of star-studded performances. The funds raised by the annual gala support the mission of the Cleveland Clinic Lou Ruvo Center for Brain Health to enhance treatments and research for Alzheimer’s, Huntington’s and Parkinson’s diseases, multiple sclerosis, ALS and memory disorders of all kinds. 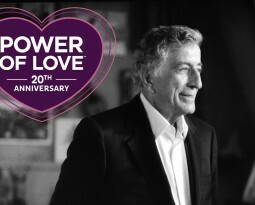 The Power of Love Gala is supported by the Las Vegas Convention and Visitors Authority (LVCVA), official sponsors HARMAN and Playground Sessions, and Keep Memory Alive, the fundraising arm of the Cleveland Clinic Lou Ruvo Center for Brain Health. For information regarding this unique celebration, please visit www.keepmemoryalive.com or call (702) 263-9797. Follow the event on Twitter with the hashtag #onememory. Cleveland Clinic Lou Ruvo Center for Brain Health provides state-of-the-art care for cognitive disorders and for the family members of those who suffer from them. The physicians and staff at the Center for Brain Health are devoted to excellent patient care, support of caregivers and development of new treatments in clinical trials. The Center offers a patient-focused multidisciplinary team approach to diagnosis and treatment, offering patients a complete continuum of care and integrated research opportunities. The facility, designed by Frank Gehry, includes clinical resources, advanced brain imaging, physical therapy, research, and the Keep Memory Alive Event Center. For more information, visit www.clevelandclinic.org/brainhealth. A premier live entertainment company, Bill Edwards Presents Inc. has been producing world-class attractions for more than a decade. The company has established itself through producing shows and events in a variety of venues – including festivals, theaters, casinos-resorts, performing arts centers and arenas. Known for its reputation of aligning with award winning talent, Bill Edwards Presents (www.billedwardspresents.com) is based in St. Petersburg, Florida. The Las Vegas Convention and Visitors Authority (LVCVA) is charged with marketing Southern Nevada as a tourism and convention destination worldwide, and also with operating the Las Vegas Convention Center and Cashman Center. With more than 150,000 hotel rooms in Las Vegas alone and 10.6 million square feet of meeting and exhibit space citywide, the LVCVA’s mission centers on attracting ever increasing numbers of leisure and business visitors to the area. For more information, go to www.lvcva.com or www.LasVegas.com.  Playground Sessions (www.PlaygroundSessions.com) is the leading application for learning to play the piano using popular songs you know and love. Perfect for all levels, Playground Sessions offers real-time feedback, video tutorials and interactive lessons designed to make learning the piano more effective and fun. Playground Sessions was co-founded by Chris Vance and Quincy Jones.